Tea Happiness- A blog on tea drinking, tea history, tea industry interviews, NYC tea experiences! National Hot Tea Month is almost at an end, but that doesn't mean you should stop learning, and trying out new teas! I decided to try a new Oolong tea this morning, and fell smack into a very important lesson that everyone should know. It may seem obvious, but water temperature is key!! If you are steeping your tea with water that is not at the proper temperature, you are disrespecting your leaves. 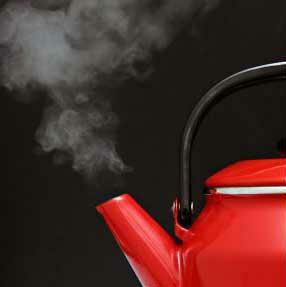 Each type of tea likes a certain temperature, and will not produce good results without it. As I discovered today, the wrong temperature can change the taste of your tea. I was steeping a lovely Formosa Oolong from Joy's Teaspoon that tasted nice, but many nuances of the tea were missing. I realized it was because I used water from our office water cooler, and it was just not hot enough. I'm going to try this tea again when I get home, and see if the results are different. Stay tuned for a review! Of course, please pay attention to your own personal preferences. For example, if you like a super strong tea, you could try a longer steep, and see how it tastes. Experiment, and see what works best for you! I think these figures are a good starting point, but I think that a bigger thing to emphasize is the personal preferences. Just found your blog, and am happily following it. Especially enjoyed this post. Am looking forward to what comes next.